On August 1 the San Francisco District Court dismissed an appeal of the dugong lawsuit brought against the United States by U.S. and Japanese environmental conservation groups for the purpose of protecting endangered dugongs. The plaintiffs requested that construction of the Futenma Replacement Facility (FRF) in Henoko, Nago City, be stopped. This trial addressed the effects of construction on dugong, and whether or not the “taking into account” (TIA) process was fulfilled. The TIA process refers to Section 402 of the U.S. National Historic Preservation Act (NHPA), which when applied to these circumstances holds that the U.S. Department of Defense (DoD) shall “take into account” the potential adverse effects on a property on the Okinawa dugong, including consultations with local interested parties. 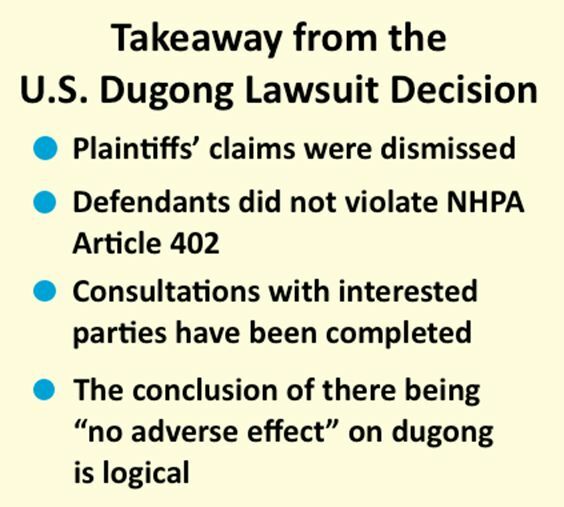 Judge Edward Chen decided that the biological assessment and cultural assessment entrusted to the DoD, based in the Japanese government’s environmental impact assessments, mean that the defendants adequately took the effects of construction on dugong into account. He found that the U.S. government’s conclusion of there being “no adverse effect” on the dugong was not arbitrary or capricious. This lawsuit was initiated in 2003, and its substantive and public hearing was concluded on June 28 this year. The plaintiffs will decide whether or not to do an appeal to higher within the next 60 days. Governor of Okinawa Takeshi Onaga has decided to start the process toward revoking the land reclamation approval allowing such work on the shore portion of Henoko to build the Futenma Replacement Facility. On August 9 there will be a hearing for the Okinawa Prefectural Government to listen to the Okinawa Defense Bureau’s explanation, which may affect future court decisions. This is the first time, historically, that a case has been brought to court regarding Section 402 of NHPA, which applies to sites outside of the United States. The plaintiffs hold that Section 402 of NHPA is the international equivalent Section 106, which sets forth that within the United States federal agencies must “take into account” the effects of their actions. Since Section 402 applies within Japan, the plaintiffs claim there should be consultations with local interested parties. Sarah Burt of the environmental law and conservation group Earthjustice, a lawyer representing the plaintiffs, said that the decision is disappointing but not surprising. She thinks the judge did not fundamentally determine what is supposed to be taken into account. She said that how law works is that the courts often issue judgments in alignment with the government’s interest, and that has happened this time.